Finally the LNA4HF is ready after the holidays break. After the initial shipment we have the firsts batch ready for delivery. The final result is the pre-amplifier for the HF frequencies covering the range from 150khz to 30MHz. The high cut off frequency limitation is due to 5 pole low pass filter at the input. There is the possibility to remove the filter and use the pre-amplifier up to 2GHz. The LNA4HF is assembled on the 0.8mm thick FR-4 laminate. The quality of the PCB is excellent and we decide to have PCB only option for the guys who want to assemble their own designs. The same PCB can accommodate all other types of MMICs with the same housing/layout. 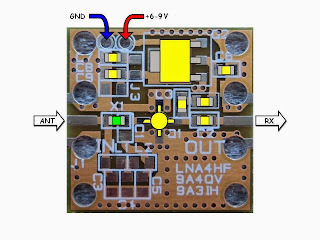 There are couple of not populated places (bridges) on the PCB where the input filter can be bypassed, the voltage regulator can be bypassed for the direct 5V power supply, the bias resistor can be replaced or shorted. For this buyers, there is the option where 2 blank PCB shipping included (priority/air) cost is 10 Euro. Contact me through the e-mail for all the details. 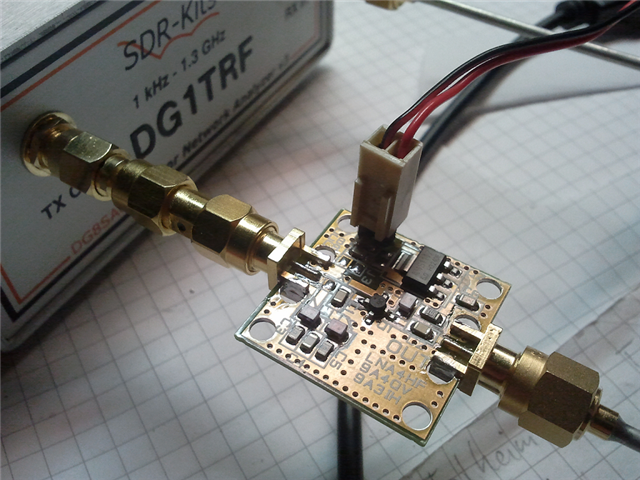 The feedback from the buyers is very important for us so down bellow we have a measurement done on LNA4HF by Thomas DG1TRF using the DG8SAQ VNA. Thanks. 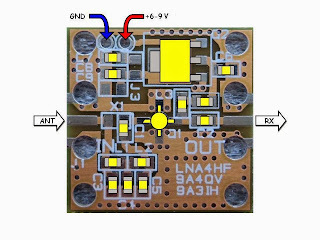 The PCB design is a quite flexible and the same PCB can be used and modified for a various projects. Here you can find some modifications that most of users are asking for. It will be a short how to guide combined with FAQ answers. Of course, all the buyers will have the schematic of the basic layout together with the all components values printed. So let's start with the basic LNA4HF layout. This is what you get when you order the LNA4HF. Amplifier ready to operate on 6-9V DC through the range of 150 kHz to 30 MHz, as per data on top of the post. The antenna input and output to receiver are matched to 50 ohms, but no significant degradation if 75 ohm cables are used. The first on the list how to is how to use the 5 V DC supply that I already have on my upconverter or the USB connection. I want to stress that I do not prefer the USB 5 V supply. There are several reasons for that, one of them is that you can damage your USB port and the PC together if something goes wrong. Despite that, this is the most required users modification, so here it is, 5 V direct supply. 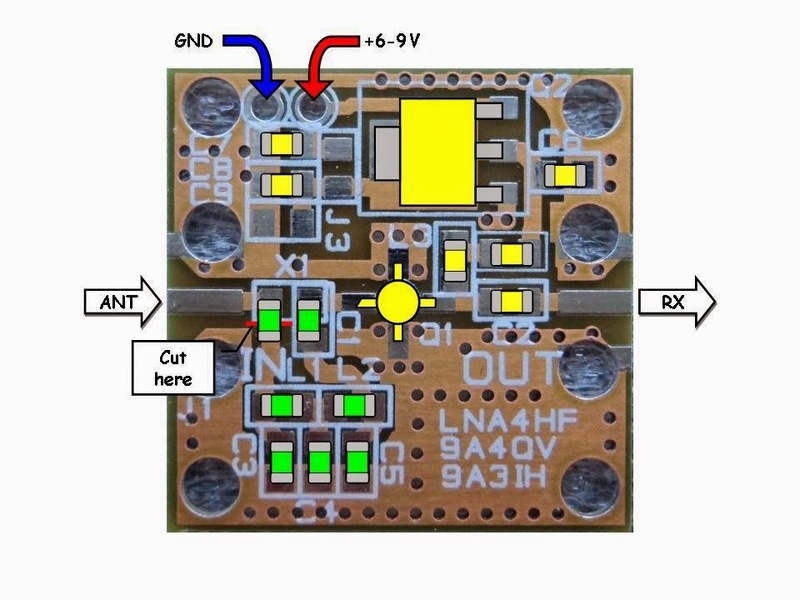 All you need to do is to insert a 0805 size 0 ohm bridge (marked green) on the PCB position J3. A peace of wire will also do the job if you do not have 0805 0 ohm SMD component. 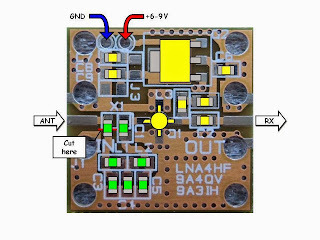 This way you will bridge the 5 V regulator on board. Now you are ready to supply the LNA4HF with the 5V. The consumption should remain the same, 18-19mA. Of course, this is not the standard resistor value and we should choose the 470 ohm resistor or parallel connection of two 1 kilo ohm resistor resulting the 500 ohms resistance. You can always check if your calculation is OK by actually measuring the 5 V on the PCB power pads. The next most required modification is the one asking how to bypass the input low pass filter. 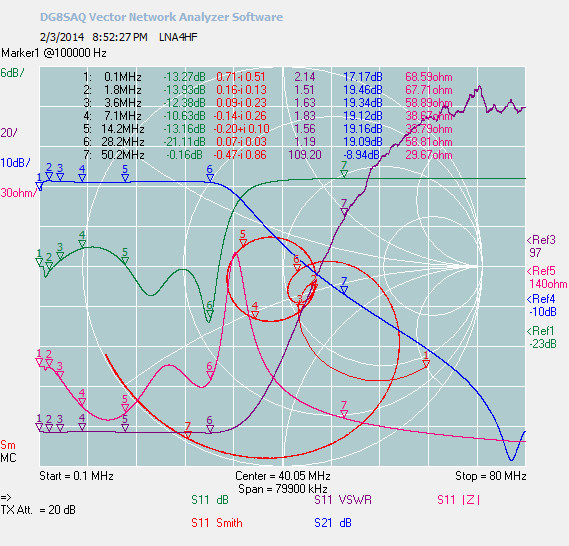 The basic design include the low pass filter cutting effectively all the signals above the 30 MHz. This can be handy to filter out all the broadcast FM radio and TV strong signals as well as the mobile tower signals. 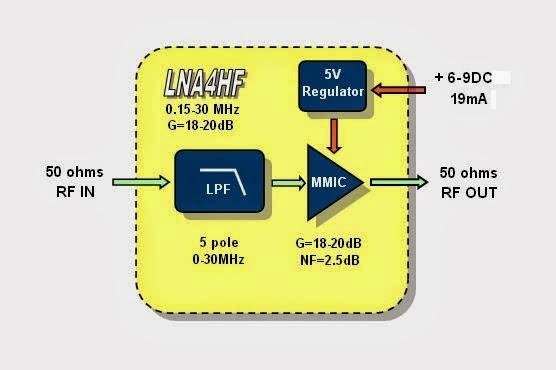 The LNA4HF mount the MAR-6 MMIC device capable of amplifying all the signals up to 2 GHz range. Hey! I can use the same LNA to cover all my DVB-T dongle frequencies and the HF upconverter frequencies. Why not? There is no simple way where you can just bridge the low pass filter (L1+L2+C3+C4+C5), you need actually to remove all this 5 SMD (L1+C3 will be enough) components and you need to turn the C1 capacitor for 90 deg. on the X1 PCB marked place. If you decide meantime to go back with the low pass filter, you will need to restore the basic setup layout. 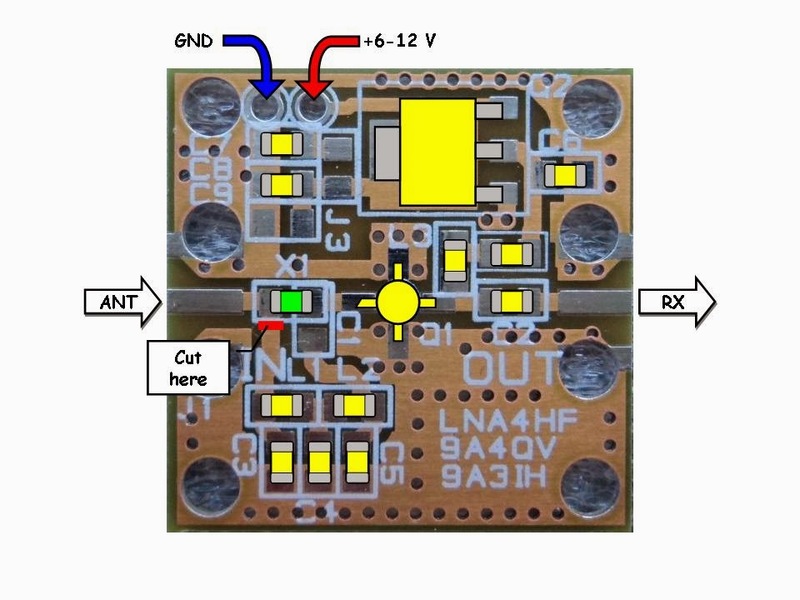 If you are not so happy to work so much with the SMD components, the easier way to do this is just to turn the C1 to the X1 position and use the X-acto knife to cut the pcb track going to the low pass filter (left side of X1). In case you want to go back to the filter, just restore the C1 to basic layout and re-solder the PCB track by blob of the solder. You want to increase the sensitivity of your frequency counter, or just to protect the counter from the accidentally high power input ? 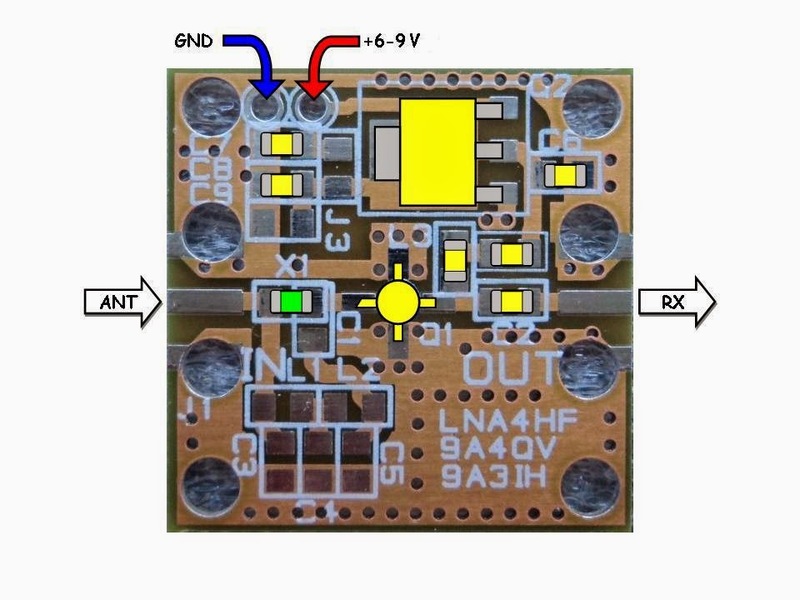 Basic layout may be used without any modifications up to 30 MHz. 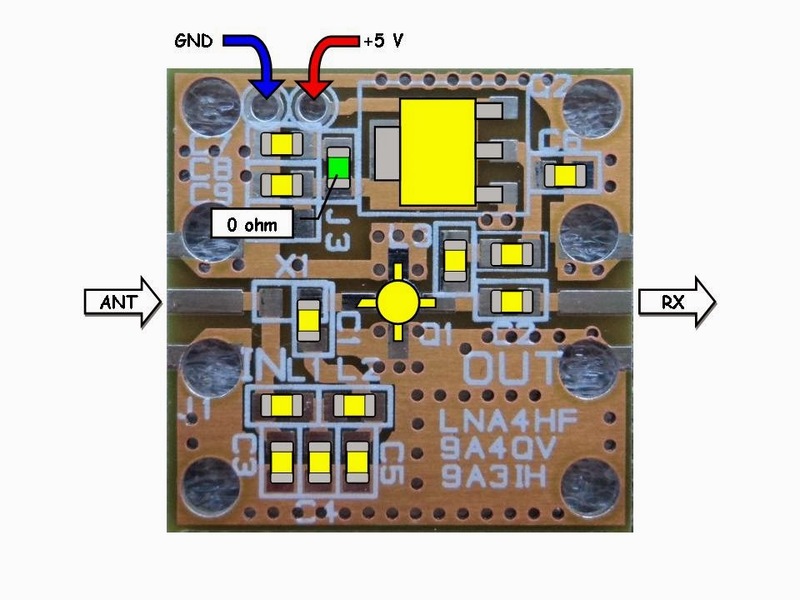 To cover the range up to 2 GHz you need to apply the modification without low pass input filter. Both cases will allow the maximum input power of 20dBm or 100mW but this will saturate the amplifier for sure. Much better option will be to use the LNA with the input attenuator. This way the amplifier can survive even higher accidentally applied power. If something goes wrong, only the input stage (LNA) will be destroyed leaving the counter still alive. At the end it is cheaper and less complicated to repair the LNA than the counter. Beside this advantage there is also the fact that adding the input attenuator the input return loss improve twice the value of the used attenuator. If you use the 6dB attenuator the input RL will be improved for 12dB. To make the proposed modification, the low pass filter should be removed and 3 resistors (green) soldered in the T configuration. The values are to be calculated using the attenuator calculator. For the proposed 6db attenuation the two series resistor value should be 18 ohms and shunt middle resistor 68 ohms. Take care about the maximum input signal your counter can handle!! The LNA4HF can be used for the shortwave radio astronomy project named JOVE. As the main activity is around the frequencies 20.1-21 MHz the LNA4HF is ready for that. An external bandpass filter at the LNA input for the desired frequency can improve selectivity and filter out the unwanted strong and ot of the band signals. It will be nice to have all that on a small board measuring only 25x25 mm. Well, this is possible and here is the way how to do it. All you need to do is to remove the input low pass filter, together with the coupling capacitor C1. Then you need to cut the PCB track marked on the place marked red. On the prepared pads we need to solder the bandpass filter for the frequencies 18-21 MHz. One of the very good designs where you can take all the values for such a filter is Tasa web page. Page 22, BP with 2 coils simplest solution Ver1.Pick up the values for the 18-21 MHz filter design and solder the parts where the green parts are placed on the PCB and you are ready for the Jupiter monitoring.